(NaturalNews) Could sulfur be the key to saving autistic children from the toxic tragedy that's been besieged upon them? Could organic sulfur crystals actually REVERSE autism? This is to be carefully considered now. Sulfate deficiency has been specifically identified in the cerebral spinal fluid of autistic children and is a KEY feature of autism. Why? The sulfate aids in growing new neurons, and the pineal gland supplies the sulfate. Dr. Stephanie Seneff described the health tragedy live on talk radio recently. She says that if a human being doesn't have enough sulfate (sulfur plus oxygen), he or she can't make new neurons. Plus, the body can't "take out the garbage" -- meaning break down cell "debris" and basically detoxify. These are just a few examples of what is going wrong in the brains of children who are loaded up with Roundup food (glyphosate-laden GMOs), aluminum-laden vaccines and flu shots, and plastic chemicals in bottled water and canned goods. Human organs are also "sacrificing themselves for the greater good" to save the body from all these toxins. This all boils back to insufficient sulfate in the blood, according to Dr. Seneff. The solution is to target the lungs and help them do that "extra" job that they were designed to do. We're over-taxing the lungs and the liver too, with all these chemicals like aluminum and glyphosate. Common toxins found in food, vaccines and plastics are working synergistically to cause autism. Glyphosate in Roundup Ready crops (corn and soy) and in water runoff suffocates sulfate in the body. So does fluorine and chlorine in water. So what's happening inside your body when you consume GM food? You're destroying the mechanism that creates sulfate in the blood. The lungs can't do their job anymore. Do you see? Top scientists for Biotechnology know this and communicate this to Big Food and Big Pharma as part of a money-making scheme, beyond just trying to increase yield or profits in the crop fields. Remember that 90% of corn, soy, canola and cottonseed oil is GMO. What foods do you eat regularly that contain glyphosate weedkiller and other bug- and human-killing pesticides? No wonder cancer is such an epidemic in America. What toxins are Americans injecting in their bodies that CAUSE autism? Listen to a CDC expert blow the whistle! Did you know that there are alarmingly high amounts of aluminum in vaccines, antacids, antiperspirants and food imported from China? Do you or your child have asthma, emphysema, autism spectrum, Asperger's or respiratory "disorders"? Maybe you just get panic attacks or get confused easily. You too could be suffering a sulfur deficiency, or deficiency in certain organic vitamins and minerals. This is not just some "magic bullet." You must rid your body of toxins. 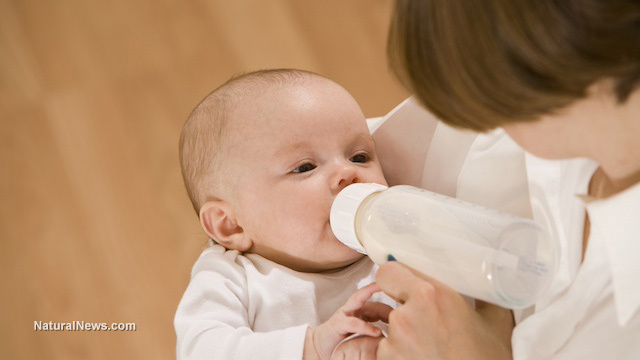 Bisphenol A (BPA) can cause birth defects and ruin fertility. Water bottles that get heated up in your car, or in the delivery trucks, or that have been sitting on store shelves for months, can contain toxic water that's doing the exact opposite of what you thought to your body. Should your first and foremost supplement be sulfur -- washed down with actual spring water that doesn't contain glyphosate or BPA? Consider this thoroughly. Also consider what genetically modified really means. GMO means giant celery with no nutrition. It looks like you're buying a lot but you got nothing. The vegetables are watered with fluoridated water too, so you're eating chemical food grown in chemical water. How will the children heal that have been vaccinated and indoctrinated into this Western medicine and genetically modified (mutated) food nightmare of a regime? Is this a form of population control? GMO means "glyphosate-cancer-food" for the masses and the "starving countries" around the world. Read the ingredients list of everything you buy and stay an informed consumer. The radio show Health Talk Hawaii out of Honolulu is international. Listen to the January 17, 2015, podcast available for free. It's titled: "The glyphosate link to autism and most diseases in general." Organic sulfur (OS) has a cleansing or "detoxifying" effect on the cells within the body and allows the body to remove toxins that have accumulated in all types of cells, including fat cells. OS is used to repair cells which have been damaged, as well as to promote the growth of healthy new cells by allowing the cells to transport oxygen more effectively. ORGANIC SULFUR also makes cell walls more permeable and thus able to allow more nutrients in and allow waste materials to pass out of the cells. Unfortunately, the grand ol' USA has been causing industrial agriculture "mayhem" for a few generations now, ruining the organic sulfur content. With the introduction of the petrochemical fertilizers, which were created to replace manure as fertilizer and to create a cash "crop" for the petrochemical industry, the sulfur in the soil was virtually destroyed. Like sulfur, the cell membrane is another blind spot in medicine. Western Medicine completely depends upon synthetic chemicals to treat symptoms. OS is not a drug or prescription medicine; it's a nutrient. OS increases enzyme production, substantially increasing immunity. OS increases increases blood circulation (lowers high blood pressure). OS reduces muscle inflammation and promotes muscle healing. Athletes use OS for quick recovery. OS is anticancer, because it oxygenates the cells and tissues, creating an aerobic environment where cancer cells cannot exist. OS studies have shown the reversal of osteoporosis, Alzheimer's disease and Parkinson's disease. This is highly valuable information for adults and kids alike. Blog talk radio is really taking off, and natural health enthusiasts know where to turn for the most concise, relevant and current information on Alternative Media -- the truth media, heard 'round the world! Click here to listen to the show: HealthTalkHawaii.com. And just where do you find organic sulfur? That's a great question. Where do you find natural remedies for just about everything? Another great question!